This satellite image from PAGASA shows tropical cyclone Paolo east of the Philippines and a low pressure area in the west. MANILA — Typhoon ‘Paolo’ maintained its strength, bringing rains to most parts of the country, state weather agency Philippine Atmospheric Geophysical and Astronomical Services Administration (PAGASA) said Wednesday. In its 11 a.m. weather bulletin, PAGASA said ‘Paolo’ was last spotted 735 km east of Guiuan, Eastern Samar, packing maximum sustained of up to 120 kph near the center and gustiness of up to 145 kph. 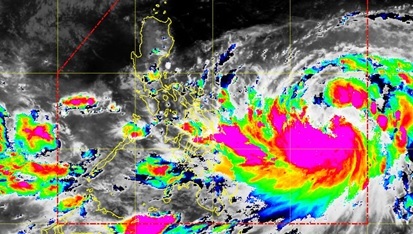 ‘Paolo’ accelerated, moving north northwest at 20 kph. The outer rainbands of the typhoon will bring scattered moderate to occasionally heavy rains over Bicol region, Eastern Visayas and Caraga becoming light to moderate rains over the rest of Southern Luzon, of Visayas and of Mindanao. ‘Paolo’ is forecast to be at 1,035 km east of Baler, Aurora on Thursday morning and at 990 km east of Tuguegarao City, Cagayan on Friday morning. It is expected to leave the Philippine Area of Responsibility on Sunday. Meanwhile, the low pressure area (LPA) spotted at 280 km west of Puerto Princesa City, Palawan will bring scattered light to moderate with possible occasional heavy rains over the province.